Fleas can quickly become a significant problem for dogs and cats and the rest of the family. Dogs and cats can pick up fleas anywhere - a park, your own backyard, even your own house if a flea‑infested animal was there before. That’s because the adult fleas on untreated animals lay eggs that fall into the environment. Each female flea can produce 40 to 50 eggs a day – that’s up to 2,000 in her lifetime. These eggs develop into larvae and pupae in the environment. Inside these pupae are ready-to-hatch fleas which can remain dormant for weeks to months in their cocoons. When conditions are right— enough heat, carbon dioxide and animal activity — the fleas hatch as young, hungry adult fleas, ready to infest your pet. Since only adult fleas are visible on the pet, by the time they are noticed there may already be a large infestation in the home environment. This is why regular monthly flea control is so important. Fleas can also lead to health problems for your pets. Some pets develop severe allergies to flea bites (called flea allergy dermatitis) and may continue scratching their skin long after the fleas have gone. Fleas are also responsible for transmitting the dog tapeworm (Dipylidium caninum) to dogs, cats and even humans. Fleas can spread bacterial diseases, too. Choosing a flea control treatment that not only kills adult fleas but also breaks the flea cycle is important to get an existing flea infestation under control and to prevent a new one establishing. Because cats groom themselves regularly removing the adult fleas it may be harder to notice when they are infested. 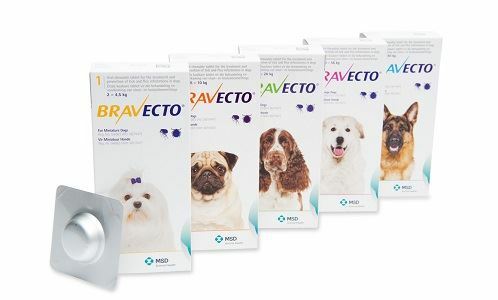 Bravecto, chewable flea and tick prevention product. Effectively killing fleas for 3 months and paralysis ticks for 4 months. This tasty chew is readily accepted by dogs. Bravecto, Topspot available for dogs and cats. The longest lasting spot-on flea and paralysis tick treatment for cats and dogsOne treatment for dogs will last 6 months against fleas and paralysis ticks, and 3 months for cats. Frontline Plus is available for dogs and cats and kills protects against all four stages of the flea lifecycle when applie monthly and in dogs only protects against paralysis ticks when applied fortnightly. Applied as a liquid on the skin by parting the hair on the back of your animals neck. 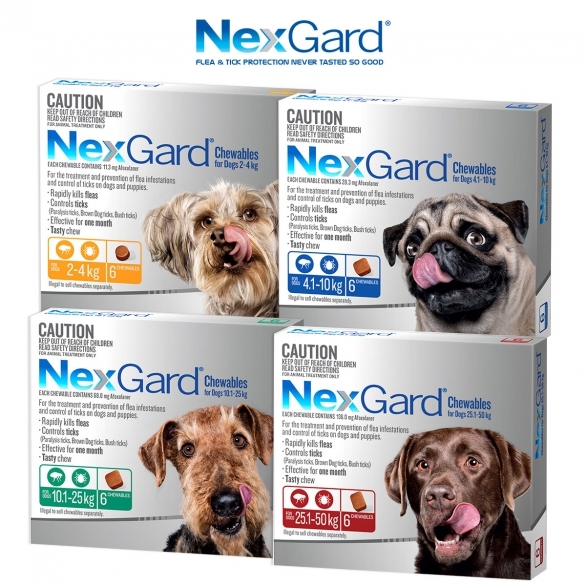 NexGard, is a beef-flavoured chewable flea and tick prevention. Effectively kills adult fleas before they lay eggs and ticks too for 30 days. Currently only available for dogs, in 4 sizes so you can select the correct weight range for your dog. As a chewable product you don't have to worry about withholding from bathing or swimming worried about reducing the effectiveness. Please call us to discuss an appropriate parasite control program for your pet.